Dreamlike wedding dress made of soft tulle with precious lace applications and a wide, transparent shoulder strap. The bodice is densely decorated up to the hips with lace applications that lightly fade into the lower skirt part and that convey a dreamy look. With its detachable romantic train the dress can be flexibly reshaped for the evening event. Simple bolero with 3/4 sleeves in the same color and material as your dress, but without any decorations or applications. Simple bolero with long sleeves in the same color and material as your dress, but without any decorations or applications. Simple bolero with short sleeves in the same color and material as your dress, but without any decorations or applications. Lace bolero with long sleeves in the same color and as your dress. 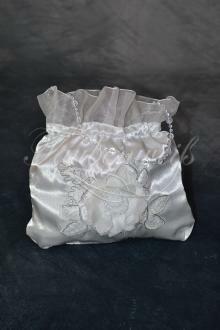 Made of the same lace as your wedding dress (if existing). Lace bolero with short sleeves in the same color and as your dress. 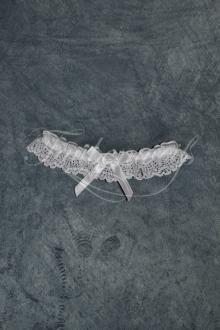 Made of the same lace as your wedding dress (if existing). Lace bolero with 3/4 sleeves in the same color and as your dress. Made of the same lace as your wedding dress (if existing). 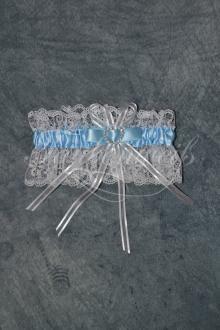 Gloves with standard lace fitting your wedding dress. One size. With a loop at the middle finger. Simple gloves without lace fitting your wedding dress. One size. Garment bag made of high-class fleece (75g/sq) in white with imprinted Taubenweiß logo for the safe storage of your dress. Folding and with two handles. Measurements: ca. 200cm x 70cm x 20cm. Suitable for voluminous wedding dresses and evening dresses. Garment bag made of high-class fleece (75g/sq) in black with imprinted Taubenweiß logo for the safe storage of your dress. Folding and with two handles. Measurements: ca. 175cm x 65cm x 10cm. Suitable for thin wedding dresses and evening dresses. Customized hard tulle petticoat fitting your dress style. All sizes. Simple petticoat (not customized) fitting the shape of your wedding dress. Matching your dress style we will sew hard tulle udner the skirt to achieve the necessary skirt width. 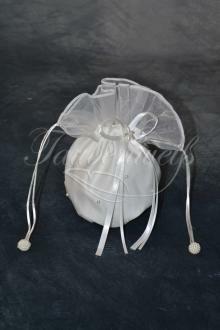 For very puffy dresses we strongly recommend you to order a petticoat with loops! Cathedral veil without comb in the same color as your wedding dress. Length about 300 cm. With comb. Long veil with comb in the same color as your wedding dress. Length about 120 cm. Long veil without comb in the same color as your wedding dress. Length about 100-120 cm. Short veil with comb in the same color as your wedding dress. Length about 50 cm. Short veil without comb in the same color as your wedding dress. Length about 50 cm. 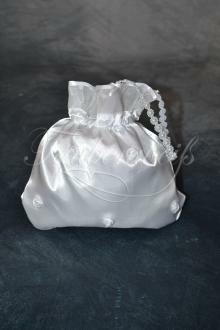 Simple stola in the same color and same material as your dress, but without any decorations or applications. Stola in the same color and same material as your dress, with the same decorations or applications as your dress. We send you with the dress a small fabric swatch of the dress material, so you can choose perfect matching accessories with it. For the delivery times please see the selected quality level. The handover to DPD is likely to take place around 05.06.2019 if payment is received today. You haven't found the right dress? * Please note that our delivery times start with the receipt of your payment and they are regular delivery periods that cannot be guaranteed. These periods can be exceeded in exceptionary cases (especially during the high season from January to June). 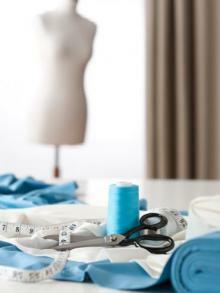 For urgent production please choose the Express production option in order to make sure your dress arrives in time. ** In the case of an express production if the unexpected does occur and the handover to DPD does not take place in time, you have the right of cancellation inspite of customized products. The Taubenweiß GmbH reserves the right to cancel the order within 72 hours after your order had been checked. *** Our products sometimes have to be altered a bit at your local tailor, inspite of the made-to-measure production. The dresses are tailored with a certain scope, so that a subsequent alteration at your local tailor should not be a problem. Please note that such alterations often have also to be made at a wedding dress boutique and there they are also put at the customer's account. Please check again your entry. Thank you.